Day 202: Another One Bites the Dust . . .
Wow – who’d a thunk it . . . 202 days of blogging about wine! When we decided to pursue this adventure we hadn’t really thought it through. There is something to be said about purchasing a different bottle of wine every day for 365 consecutive days (for the record, Jean’s not so good with consecutive day stuff – just sayin’). BUT, here we are. . .moving ahead and staring into the face of yet another weekend. Weird, but this weekend is the first one of Spring! Yeah, so this has been happening since last September 1st. . .granted it was late summer, but it means we’ve made it through fall and winter and now we start blogging during the Spring! Time sure flies–when you’re having fun! It’s been a long week–same number of days, but just a long week. You know how that goes—a couple of early mornings combined with several long evenings. . .and the end result is a long week! Fortunately, we have Daughter #1 and Daughter #2 to keep us ‘entertained’. . .this past week had Daughter #2–camping and sailing along the Eastern seaboard of the US. . .now, before you get too impressed, remember–in THAT part of the world, it’s still winter. Yeah, like in cold temperatures and cold rain and wet snow. In fact, that part of the world could go into late April with cold and wet. . .exactly why we chose not to live in them thar parts!! That said, she’s had a great time sailing and being a part of something that she’ll remember for the rest of her life. . .c’mon, sailing on Spring Break for your College? How cool is that? Daughter #1 was back in the classroom this week as Spring Break ended and reality began to sink in–yep, in less than eight weeks, that college experience is DONE! We’re looking at graduation, new employer and starting fresh. It brings back amazing memories of our graduation from SFA–how awesome is it to share that same experience with our daughter? Tonight, we enjoyed a wine from one of our favorite Paso Robles wineries–Castoro Cellars—-as THEY say it, puts out some “Damn Fine Wines”. From OUR perspective, they are spot on! From Cabernet Sauvignons and Zinfandels to amazing blends and Petite Sirahs, Castoro has become our favorite ‘house’ wine. We love their varietals, their wine makers and yes, their wines! 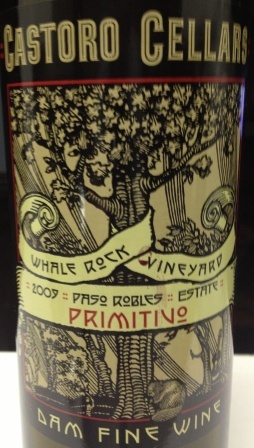 So, in keeping with their really good wine, we opened a bottle of 2009 Primitivo from the Castoro Cellars Whale Rock Vineyard in Paso Robles, California. We learned last night that Primitivo is the Italian version of Zinfandel in America. No wonder we like it so much!!! This is a BIG wine. . .and not for the faint at heart. From the Castoro website, “The last two years our Primitivo has been the top selling wine in our tasting room and after just one sip you will understand why. From our organically farmed Whale Rock vineyard, this clone of Zinfandel is a fruit-filled wine crafted in an Italian style.” The grapes for this wine come from the Templeton Gap. As this vineyard matures the grapes are developing more character and layers of flavors which you’ll notice in the aromas and the mouth. Primitivo is a clone of zinfandel imported from Italy, thus some of zinfandel’s characteristics will be found in the wine. It’s a lively, fruit-filled wine that has a touch of earthiness that is associated with northern Italian wines. What we know is that this wine is a terrific option for Zin-lovers. It’s got lots of body, structure, taste and finish. . .which we’ve come to expect from Castoro! Whether enjoying with gourmet food or sitting back on a Thursday night after a long day at work, Castoro knows how to make good wine, AND make it ready to show! Until tomorrow, remember to enjoy your favorite wine responsibly and recycle whenever possible! Categories: Uncategorized | Tags: california, Castoro Cellars, CEntral Market, food, friends., peachy canyon | Permalink.